In 1980 in Rome, African bishops met members of the Emmanuel Community and gave them a challenge: “We need young people coming in the name of their faith to support us in our development projects and offer assistance to our local population. Come join us! 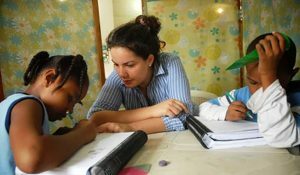 ” Pierre Goursat, founder of the Community, answered the call with the creation of Fides Co in 1981: Faith in Cooperation … 30 years later, Fidesco is the 4th largest French NGO sending volunteers abroad, Fidesco has offices in 11 countries, including operations in the USA since March 2010. With the creation of Fidesco, the Emmanuel Community is implementing its main characteristic: the unity between faith and action. Without action, our faith will be angelism. Without faith, action is simply solidarity. Charity unites the two. This is the road map that Pope Benedict XVI has given to Fidesco stated to the Emmanuel Community in Rome on February 3, 2011, “May the glow of your love be a strength to build a more just and fraternal world.” Therefore, Fidesco has a commitment to serve the disadvantaged in cooperation with Churches of Africa, Latin America and Asia. At the heart of the commitment of volunteers, “there was a call that was the crux of the mission” summarizes Dominique Vermerch, who was part of the beginning of Fidesco. Before being Secretary General of Fidesco in 1988, he and his wife Brigitte, were among the first Fidesco volunteers. Challenged by poverty and the harsh conditions of the inhabitants of the Southern emisphere the volunteers are motivated by the desire to serve through their skills and by transferring them. They discover with time that “the crux of the call to go on mission” took shape in the “to live with.” Many former volunteers confirm that what remains at the end of two years, is the quality of the relationships formed, the bonds forged with people. Christian You, Fidesco director from 1992 to 1995, recalls what a local partner said when welcoming a volunteer carpenter, “But what we are looking for in welcoming him, is not just his technical skills, It’s HIM.” “Living with” means to give priority to the encounter with the person. That’s where the secret of joy in the mission lies. Jean Robin, Fidesco International director from 2004 to 2010, emphasized: “I saw how generous youth would live on mission, sometimes still a bit cramped by their Western education. You could see the difference with their return from mission: open, full of humanity, with a tender heart. And, of course, armed with a joy that surpasses them. “. The founding intuition of early Fidesco has remained unchanged and is still as strong as 30 years ago. Fidesco changes gradually. Bit by bit the organization is refined and rationalized. We had to find funds and become recognized as a credible player in the family of Christian and international volunteer organizations. The seriousness and variety of skills implemented by the early volunteers have contributed greatly: medical, logistics, management, education, social, Human Resources, agriculture, etc. Over time, Fidesco capitalized real international expertise in its intervention areas, a skill first recognized by its partners. 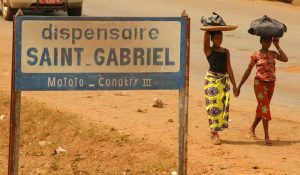 In 1987, the Archbishop of Conakry in Guinea, Sarah Bishop (now president of the Pontifical Council Cor Unum) entrusted to Fidesco the management of a medical clinic in Matoto. Currently more than 80,000 people are treated there each year. Soon after, at the request of other bishops, farm schools were also entrusted to Fidesco: in Ivory Coast since 20 years, and later in Madagascar and Indonesia. The social and legal projects that also exist in Africa and Latin America show the variety of the professionalism of Fidesco. So, naturally, Fidesco over the last 30 years has become a member of the leading international development NGOs. Present today on the three under-developed continents and in 35 countries, Fidesco continues to meet increasing demands of its partners. The demands for volunteers come from far away: Timor, Papua, Kyrgyzstan, Ossetia… The harvest is plentiful but the laborers are few. 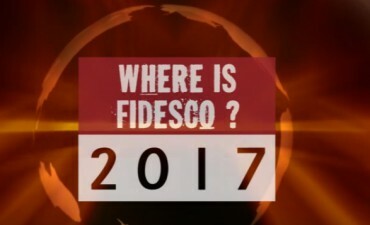 However, Eric Barthélémy, the current Fidesco International director, is not blindly forging ahead. While efficiency is important in the provision of expertise to its partners, the key word for Fidesco is growth. At the end of the world, in cities or in the bush, in all cases, the mission is a rich experience for those who leave as well as for those who welcome and remain. “You can have the impression, when seeing the volunteers leave,” said Christian You, “to deprive ourselves of forces which we need so much locally. In fact, when one or two go on a mission, the entire society benefits! For them it is the discovery of other communities, other issues, it is an opening in the world, broadening our scope, an in depth welcome of differences…” For the volunteer it is even more evident what the mission brings. Disturbed in their way of life, left to their own limitations, their characters are tested. It is the essential experience of self-giving. At their return recruiters and staffers are not mistaken when they hire volunteers. The majority of volunteers quickly reintegrates into working life. This is probably one of the great signs of recognition of Fidesco’s 32 years.